In Massachusetts the law governing septic system installation and maintenance is known as Title V. Whenever a home owner is going to be selling their home they will need to get what is called a Title V inspection done. In order to close on a property in Massachusetts you will need to have a passing title V.
If a Title V test reveals that the septic system has failed a seller has two options in order to get to the closing table. They can either replace the system prior to closing or they can put an appropriate amount of money in escrow guaranteeing the system will be fixed. A third option could be to get the buyer to pay for the septic system although this is less likely to occur unless the buyer is desperate for the property. Most lenders will accept funds to be held in escrow, however they are going to generally ask for 1.5 times the cost of the estimated amount to install a new system. For example if a septic installer gives a quote of $20,ooo for the installation of a new system, the lender is going to ask for $30,000 to be held in escrow. One of the things a Title V inspection will reveal is what is known as the septic systems “capacity”. A septic system is “rated” according to it’s bedroom count. For example if a septic system has the capacity for four bedrooms it will say as much in the report. One of the subjects I have written about in the past is bedroom count misrepresentation with septic systems. The are many Realtors that don’t even know this law exists and have put homes on the market stating there are more bedrooms than the septic system capacity allows for. In other words if the septic system is only rated for three bedrooms you can not market your home as a four bedroom regardless if you have a room that qualifies as one. This is an easy way to get sued. Don’t make this mistake as it could be a costly one! By the way, the qualifications of a bedroom must be a room providing privacy primarily used for sleeping purposes, have at least one electrical outlet, ventilation, at least one window, and have minimum dimensional criteria. There are also some towns where you need to have a closet as well although some also will accept space to house clothing such as a bureau. One of the things that I made mention of in the article about septic system misrepresentation is how a home owner could potentially add an addition to their home that could be construed as a bedroom. It could meet all the criteria of a bedroom but not necessarily be used as such. One of the things I have seen become more common place over the last couple of years is towns forcing home owners to put deed restrictions on their properties. This can happen because of the bedroom issue as well as another little know Title V rule. When calculating bedroom count one of the rules of calculation is to take the number of rooms in the home and divide that by two. For example, a proposed “game room” addition to a nine room, 4-bedroom house will create the tenth room of a house. Per Title 5, the number of bedrooms is calculated as: 10 rooms divide by 2 equals 5-bedrooms. A deed restriction can be used so that a building permit may be issued for homes that exceed the approved septic design flow based on the total room count. The intention of the deed restriction is to resolve the possible conflicting Title 5 definition of a bedroom to the actual bedroom count. This deed restriction is not intended for construction that will actually increase the bedroom count beyond the approved design. If sometime in the future the septic system is upgraded to meet additional bedroom flow capacity, or the house becomes connected to public sewer, the owner may request the Board of Health for a release of the deed restriction. This release also gets recorded at the Registry of Deeds. A deed restriction is also not something that has to be done although the alternative to a deed restriction would be to seek approval from the Board of Health to upgrade the septic system in order to meet the proposed design capacity. What I have found interesting about these Title V bedroom count deed restrictions is that some towns are fairly rigid with them and others are not. I know in my home town of Hopkinton MA the board of health regularly puts deed restrictions on properties using the room count divided by two formula. About the author: The above Real Estate information on Massachusetts Title 5 bedroom count deed restriction was provided by Bill Gassett, a Nationally recognized leader in his field. Bill can be reached via email at billgassett@remaxexec.com or by phone at 508-435-5356. Bill has helped people move in and out of many Metrowest towns for the last 24+ Years. What is the appropriate size tank for a 4 bedroom home? Hi Greg – A 4 bedroom septic system will typically have a 1500 gallon tank. What does a deed restriction mean exactly? If you have less than a 3 bedroom septic you need a deed restriction to say the house can only have 2 bedrooms, no? But a house with a 3 bedroom septic can only have 3 bedrooms. So basically what I’m asking is what is the point of the deed restriction, as the house can only have the number of bedrooms that it’s septic can handle. Anthony the article answers your question. Here is the excerpt: “When calculating bedroom count one of the rules of calculation is to take the number of rooms in the home and divide that by two. I have a 2 bedroom restriction. I bought my house six years aga and it has total eight/nine (depending how u look my house) room. I am trying to sell my house as we are moving from MA and having a real hard time with this restriction. Your article really give me a good insight. can you tell me what should i do (which doesn’t cost a fortune) to sell it. what are my options? Hi Nabila – Unless you increase the capacity of your septic system I do not think there is anything you can do about the restriction. Thanks for the article. Do you if this deed restriction is still an option in MA? It would allow me to finish my basement which would be the tenth room on a four bedroom septic. If it is available, do I file it with the town (Ipswich) or the state? Hi Aaron – you should check with your town on the deed restriction. Not every town will do it. 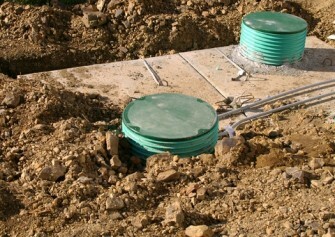 How large a septic tank do i need for a 2 bed room house ? Frank the typical tank size for a two bedroom home is 1000 gallons. Hi Jaque – Not that I am aware of but you may want to speak with a local engineer who should be able to give you a definitive answer. Hi Bill, so what size septic tank do you need for a 4 bedroom home? My home was built in 1965 and a 1000 gallon septic tank was installed. Our home is listed and we have been paying taxes for a 4 bedroom, but we presently use what was titled the “Master Suite”, as our family room and want to add a 2nd level to it and put in a true master suite upstairs and continue to use the main level room as our family room. We have 6 rooms in our home and adding another will make it 7 rooms. Are bathrooms counted as rooms? Thank you. Hi Steffanie – bathrooms are not counted as rooms and also have no influence on title V and bedroom counts. A 1000 gallon tank I believe would render your home to “rated” as a three bedroom. A four bedroom home will have a 1500 gallon septic tank. I have a house with 3 bedrooms (6 rooms total) and a 3 bedroom sized title V septic system but a 2 bedroom deed restriction due to nitrogen loading. My lawyer and real estate agent will not allow me to list and sell it as a 3 bedroom because it is not a legal 3 bedroom. What can I do to remove the deed restriction or increase it to 3? Do I need to add a denitrification system to make it a legal 3 bedroom? Hi Jason – you would need to consult with a local engineer to see if it is possible to increase the septic capacity. It may be possible to increase the size of the leach field. My husband and I are currently interested in a home listed as having 3 bedrooms. The owners have done some renovating/remodeling, and when we actually viewed the home, it appears to only have 2 bedrooms – there are two rooms with windows, a door, and at least one outlet (clearly bedrooms) and the 3rd “bedroom” is at the top of the stairs, has windows and an outlet, but does not have its own door. Also the doors to the 2 typical bedrooms open into this room. Does it sound like it should qualify as a bedroom and shouldn’t the assessment of the house/listing be adjusted accordingly? Kristina as I understand your question you have to walk through one bedroom to get to another? While it could be considered a bedroom this is what you would call “functional obsolescence” which essentially means it is not a favorable situation. You can have a bedroom in a basement as long as there is a means of egress. I also live in Hopkinton and am having a hard time getting a building permit for an attic renovation. I have a four bedroom house that has eight rooms and a finished basement with two additional rooms. There is one bedroom type of room in the basement but there are no windows so I don’t think it counts as a bedroom. I am trying to make the attic into a legal, large single bedroom suite. My septic system is designated as four bedroom even though my leach field is 50% bigger than what is required. The original plan was to enlarge the septic system or to move it to a different area making it into a six bedroom system. Unfortunately, over the last few months and three trench tests, it has been discovered that there is no possibility of increasing the size of my system or moving it. I think this leaves me with just the option of a deed restriction. But does that also mean that I will need to take out an existing wall of one of the current four bedrooms so that after building the attic I still have only four bedrooms? Obviously I would prefer not to do that. My feeling is that the Board of Health and Building Department have a little too much discretion and I would like to level the playing field a little. Any suggestions? Brett – I don’t see anyway around the situation other than having the deed restriction. Thanks for your prompt and honest answer. But does that mean that I can actually have five bedrooms (all with walls and doors) in the house as long the deed reflects that it is only a legal four bedroom dwelling? Will the building inspector issue a permit for new construction of an attic renovation?